This article describes how to add a node to the Kubernetes cluster template in the Skytap public template library. In the navigation bar, click Environments, and then click Templates. Click Skytap to display the Skytap public templates. Search for Kubernetes. If your account has access to multiple regions, you’ll see multiple copies of this template. 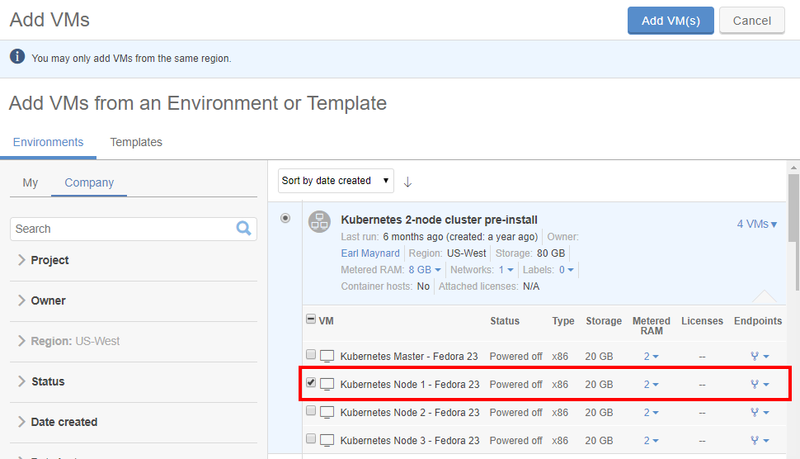 Choose the Kubernetes 2-node cluster pre-install - Fedora 23 template in the region closest to your physical location, and then click New Environment. The Deploy a new environment dialog displays. Click Deploy. The Kubernetes 2-node cluster pre-install environment is created. The ADD VMS screen displays. Select the environment you just created (Kubernetes 2-node cluster pre-install - Fedora 23). Clear the checkboxes for all of the VMs except Kubernetes Node 1 - Fedora 23. Click Add VM(s). A second instance of Kubernetes Node 1 - Fedora 23 is added to the environment. On the VM tile of the second instance of Kubernetes Node 1 - Fedora 23, click (Edit VM Name). In the Rename VM dialog, change the VM name to Kubernetes Node 3 - Fedora 23. On the Network Adapters tab of the VM Settings page, click Edit Network Adapter. The Edit network adapter dialog displays. Change the Hostname to node-3. On the environment details page, click (Run this Environment). After the environment is running, click the VM tile for Kubernetes Master - Fedora 23. Use the Skytap toolbar to login with the kubernetes user credentials. From the command line, type cd contrib/ansible/. Type vi inventory to edit the inventory, and then press i to enter insert mode. Press Escape, and then type :wq and press Enter to save the changes and exit vi. Type ./setup.sh and press Enter to start the setup. When prompted to continue connecting, type yes and press Enter. Kubernetes starts up, including the newly added node-3. To verify the deployment, type kubectl get nodes.